May 13 marks the 10th anniversary of one of the bloodiest events in the history of modern Uzbekistan. On that day in 2005, thousands of Uzbek citizens took to Babur Square in the city of Andijan in protest. The demonstration was a reaction to the three-month trial of 23 entrepreneurs from the Andijan suburb of Bogi-Shamol who practiced the moderate teaching of self-taught theologian Akram Yuldashev. As part of their religious practice, the businessmen donated to various nonreligious charitable projects—including nurseries, orphanages, and sports activities—that went against the system of corruption that reigned, and still reigns, in Uzbekistan. During the course of their trial, the community rallied respectfully in support of the entrepreneurs. During the night of May 12, a small group of men helped free the unjustly incarcerated defendants. The next morning, thousands of residents took to the streets to peacefully show their support and see what was going on. President Islam Karimov arrived in Andijan early that morning to personally direct the official response to the protests. Instead of seeking a dialogue, President Karimov immediately resorted to violence and ordered the military to suppress the demonstration by all possible means. Armored vehicles and snipers attacked the crowd, shooting indiscriminately. At least 500 people, among them women, children, and the elderly, were killed. 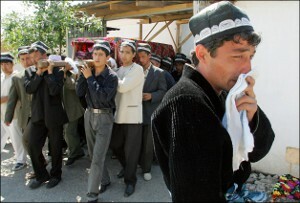 The next day, 200 more were killed when they tried to cross the border into Kyrgyzstan. Miraculously, 580 people managed to flee to Kyrgyzstan, 80 of whom were deported back to Uzbekistan by the Kyrgyz authorities. The remaining 500 were eventually resettled in Western countries thanks to support from the U.S. State Department, as well as the EU and UNHCR. These people were saved from likely deportation and harsh punishment back in Uzbekistan because the U.S. government prioritized human rights concerns over geopolitical considerations, including the risk of losing access to the Karshi-Khanabad (K2) airbase in southern Uzbekistan. Within a few years, however, Western priorities began to change as the war in Afghanistan picked up and relations with Pakistan soured. As the West sought to move more and more supplies to its troops through Uzbekistan, the EU dropped its ban on arms sales to Uzbekistan and the U.S. government waived sanctions prohibiting the provision of any assistance to the Uzbek government. Today, some in the West believe that the events of Andijan are well in the past, and that it’s time to turn the page and embrace an unconditional dialogue with Uzbekistan’s ruling regime, which is seen as a geostrategic partner in the war against terrorism and in the West’s dispute with Moscow over its neo-imperial policies. But the Andijan tragedy didn’t end in 2005. It continues today, acquiring new forms. During those protests, some 245 demonstrators were arrested, denied access to justice, and sentenced to long prison terms. At least 11 have already died as a result of torture. After the Andijan events the Karimov regime reinforced its repressive policies, especially against independent journalists, civil society activists, and Muslims who wished to practice their religion outside of state-approved structures. According to Human Rights Watch, 12,000 Uzbek citizens have been imprisoned in the country’s gulag for attempting to practice their religion peacefully independent of this state-imposed religious system. Since Andijan, hundreds have fled the country and sought asylum abroad. The leader of the Association for Human Rights in Central Asia, Nadejda Atayeva, a refugee herself, says that in the last 10 years, over 1,000 refugees from Uzbekistan have applied for her assistance. This is just a small fraction of the total number of Uzbek refugees that have escaped Karimov’s repressive machine. Since the events of 2005, the Uzbek authorities have worried that this wave of refugees could bring trouble should they ever decide to join the ranks of the political opposition. To pre-empt this possibility, the regime launched a secret program to pursue real, alleged, and potential opponents who reside outside the country. This program led to extraditions, using the mechanisms of Interpol and the CIS Minsk Convention on Legal Assistance of 1993, and even abductions and assassinations when legal channels didn’t yield results. For instance, Lutfullo Shamsutdinov, a human rights defender who reported on the Andijan massacre and was later granted asylum in the United States, has been hunted since 2005 by the Uzbek authorities, who convinced Interpol to issue a warrant to detain him. Due to this warrant, Lutfullo had to wait five years for the green card that gives him permission to travel abroad. In 2006, another Uzbek human rights activist, Isroil Haldarov, was abducted from Kyrgyzstan, where he was registered with the local office of UNHCR as an asylum seeker. In cases where neither extradition nor abduction worked, the Uzbek security services have sometimes resorted to murder. In October 2007, Alisher Saipov, a Kyrgyzstani journalist of Uzbek ethnic origin, was assassinated; Uzbek security agents are widely believed to be responsible for his murder. And in February 2012, in Sweden, there was an attempt on the life of the popular Uzbek Muslim theologian Obidkhon Nazarov, who had been long hunted by the Uzbek security services. The Uzbek authorities have also systematically harassed the relatives of Andijan refugees who remain in Uzbekistan in order to discourage the refugees from engaging in political or public activity. For years, the relatives of Andijan refugees have been banned from leaving the country to reunite with their parents and spouses abroad. Western countries should realize that the conflict between state and civil society in Uzbekistan has long moved beyond the country’s boundaries. In its pursuit of dissidents the Uzbek regime uses all available mechanisms—regional and international, legal and quasi-legal—and goes completely outside the system when they feel the need. Very few in the West have spoken out against this practice of cross-border repression. Ignoring it only encourages the Uzbek regime and its security services to commit further crimes.